Harrogate Self Storage now offer secure and confidential document shredding to business, commercial and domestic clients. Bring your own archive box/bag to our facility. We can shred your documents while you wait. Includes certificate of destruction if required. Latest industrial shredder conforms to DIN 3 levels. 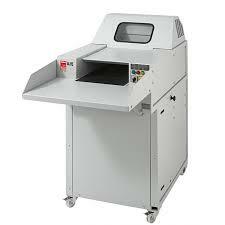 Shredding machine is monitored 24/7 by CCTV. All staff are DBS checked and CLEARED as a minimum.